The Bakken Formation covers a land mass south from Saskatchewan and Manitoba, Canada into northeast Montana and western North Dakota. Williston, North Dakota is at the heart of drilling activity and has experienced a tremendous boom from the increased oil and natural gas drilling. The biggest reason for increased drilling activity is advancements in technology including “fracing” and horizontal drilling. The local hotel market has benefited immensely from this boom. This article discusses how the oil boom has impacted the hotel market in the area. In the past decade, the Bakken Formation oil and natural gas boom has burst upon parts of Eastern Montana and Western North Dakotas bringing hordes of oil field workers, convoys of heavy equipment, and a tidal wave of investment money. Life in the area’s small towns has changed, and towns all along the Bakken Formation are feeling the impact. Across cities in sparsely populated North Dakota and Montana, hotels have no vacancies, apartment complexes are full, and RV parks are popping up to catch the overflow of oil field workers pouring into the area. One such town that is at the heart of on-going oil boom is Williston, North Dakota. In Williston, traffic has become challenging, restaurants are crowded and hotels are sold out for months. North Dakota continued to lead the country in June with lowest state jobless rate of 3.2%, which is a full six points below the national June jobless rate of 9.2%, thanks to the increased oil drilling and exploration. Help-wanted signs are everywhere, and just like in the 1980s, oilfield workers are being hired on the spot. The Bakken Formation is a large unconventional resource that underlies the western portion of the state of North Dakota. It has been an exploration target several times since oil was discovered in the state. Drilling success in the Bakken Formation of Montana has once again focused interest on this resource. In the past decade, activity has also increased on the North Dakota side of the Williston Basin where the majority of the formation exists. North Dakota set a new monthly oil production record of 11,540,000 barrels in June, which was above its year-ago level by 22% and above the June level two years ago by 79%. In 2011, oil production has averaged more than 10.8 million barrels per month, which is double the monthly production levels in 2008 and triple the levels from five years ago. Oil-related employment in North Dakota has more than doubled in just two years, from 6,900 jobs in June 2009 to a new record of 15,600 jobs in June of 2011. While the national economy struggles with another “jobless recovery,” North Dakota has continued to add jobs, and not just oil-related jobs. Many industry analysts indicate that this oil boom will last longer because companies are using better technology to draw oil from the Bakken Formation. However, the actual amount of recoverable oil is hard to estimate and has been disputed by a few industry analysts. A 2008 U.S. Geological Survey report estimated that there are approximately three billion to 4.3 billion barrels of technically recoverable oil, which is higher than their previous estimates. The USGS plans to start a new assessment of the Bakken Formation in October 2011. 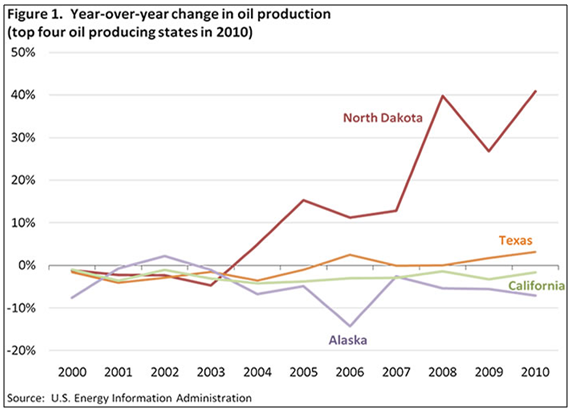 The following chart highlights the year-over-year change in oil production in North Dakota compared to Texas, California and Alaska. In short, North Dakota is booming and this boom has had an incredible impact on the lodging market in several small towns where there are very few quality hotels or motels. 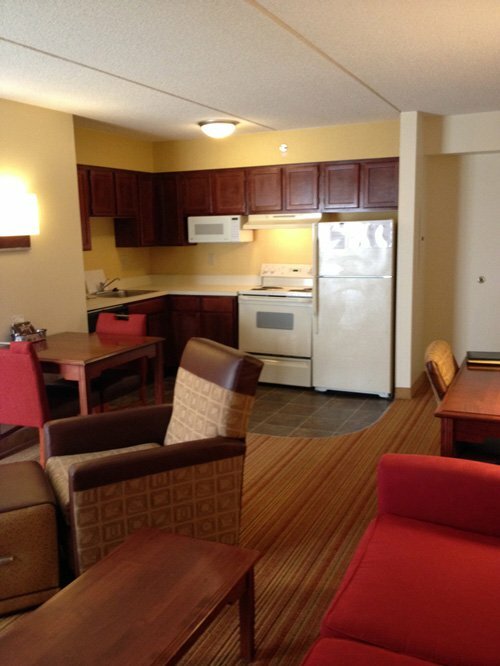 With housing supply playing catch up, hotels in Williston have benefited a great deal. With memories of the last oil boom and bust in the 1980s still fresh in the minds of many locals, housing has not come at as fast a pace as the number of oil rigs. Makeshift settlements of workers have sprung up in many locations near the drilling activity. Without an advanced reservation, one would be lucky to find a hotel room in Williston, North Dakota. The increase in oil drilling activity has had a similar impact on neighboring cities of Minot, ND; Sidney, MT; Glendive, MT; and Dickinson, ND. There are currently 10 hotels providing 883 rooms in Williston. The lodging supply has increased from 648 rooms in 2006 to 883 rooms in 2011. 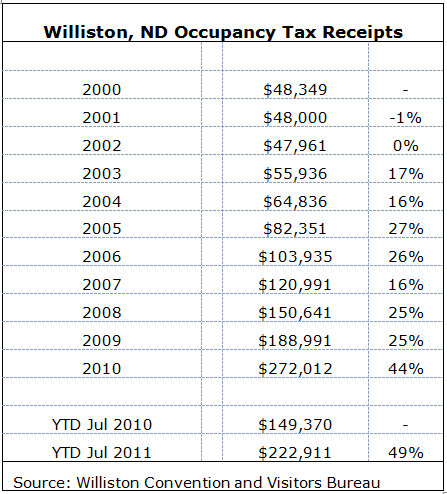 Lodging demand in Williston has steadily increased from 2006 through 2011 due to the record oil drilling and oil exploration in the Bakken Formation. Historically, the majority of hotels in Williston were independent and non-franchised; however, with the recent oil boom three franchised hotels have opened in the past two years, and there are more hotels proposed in the area. There are two additional hotels proposed and one 88-room Holiday Inn Express under construction in the market. According to the Williston Convention and Visitors Bureau, phones are ringing all the time at local hotels and the CVB inquiring about room availability with guests being sent to hotels as far as 130 miles in Dickinson, ND. As the whole region is sparsely populated, there are very few hotels. Our interview with two local hotels indicated that they are sold out for the year. City wide rates at hotels in Williston typically range from $90 to $150 per night. Occupancy tax has more than doubled just in the past four years, as indicated in the following table. There is a deep need for housing in Williston, both for the general populous and the wave of oil field workers coming to the area. According to a local broker, some banks are reluctant to provide loans for new residential construction, as many banks were hit hard with the oil bust in the 1980s and want to avoid the same mistake again. Hence, the shortage in the housing supply is being filled by the hotels. If the oil boom continues and the USGS revises their numbers upward for the recoverable oil, more hotels will be needed in the region. Furthermore, increased oil production in the state is prompting investment in pipelines and infrastructure to transport the crude to eager U.S. markets. In addition to a number of pipeline expansion and construction projects, some companies are resorting to railroads to deliver oil production from the state. A mega-solution is the Keystone XL Pipeline. The proposed $13-billion pipeline is an approximate 1,661-mile, 36-inch crude oil pipeline that would begin at Hardisty, Alberta in Canada and extend southeast through Saskatchewan, Montana, South Dakota and Nebraska. It would incorporate a portion of the Keystone Pipeline (Phase II) through Nebraska and Kansas to serve markets in Oklahoma before continuing through Oklahoma to a delivery point near existing terminals in Nederland, Texas to serve the Port Arthur, Texas marketplace. However, the construction project, which will span two countries and myriad states, is still undergoing the approval process with the U.S. government. Hotels in the Bakken region could see more demand if this pipeline construction gets the regulatory approval; that is, if there are hotel rooms available to accommodate the additional demand. Nuresh Maredia is a hospitality consultant and appraiser. He has a wide range of experience in operations in hotels and resorts. 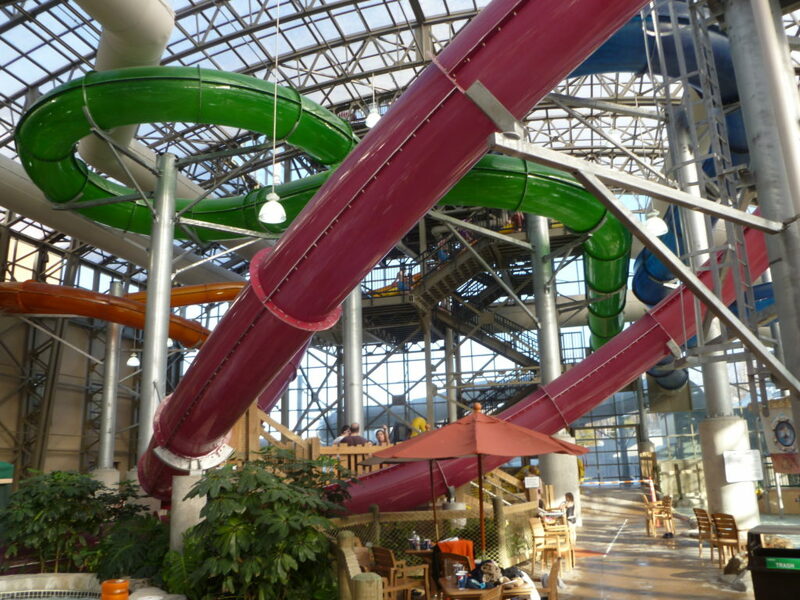 Mr. Maredia performs appraisals, market feasibility studies, economic impact studies, and impact studies throughout North America for a wide range of hotels, waterparks, amusement parks, ski resorts, family entertainment centers, timeshare resorts, and other leisure real estate. He obtained his Bachelors in Finance and Masters in Hospitality Business from Michigan State University. He is a state certified real estate appraiser.